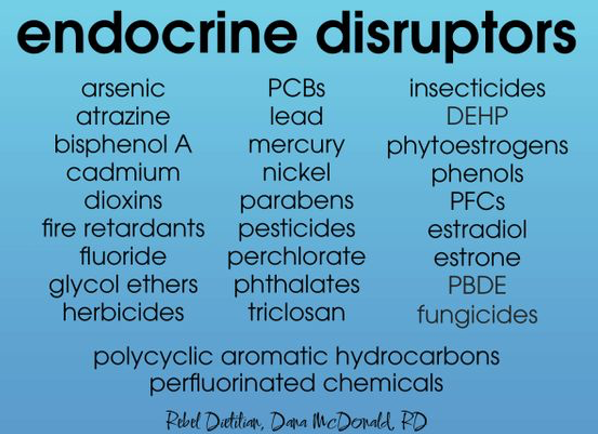 Endocrine disruptors are chemicals can affect any part of hormone function.1 They are found in pesticides, industrial chemicals, flame retardants, plastic packaging components, food, fuels and other materials that are used in daily life.1 They include PCBs, dioxins, phytoestrogens, phthalates. 1Cianfarani, S, & Söder O. (2016). Endocrine disruptors and child health: New insights. Hormone Research in Paediatrics, 86, 219-220. 2Landrigan, P., Garg, A., & Droller, D.B.J. (2003). Assessing the effects of endocrine disruptors in the National Children’s Study. Environmental Health Perspectives, 111, 1678-1682. 3Alonso-Magdalena, P., Quesada, I., & Nadal, A. (2011). Endocrine disruptors in the etiology of type 2 diabetes mellitus. Nature Reviews Endocrinology, 7(6),346-53.